This 2017 Eagle season is the kind that allows you to kick back and relax. Nostrabombus went 5-1 on picks this weekend. Picking against the Eagles to cover a big number at home against the Broncos. It wasn’t so much that we thought the Birds would lose. 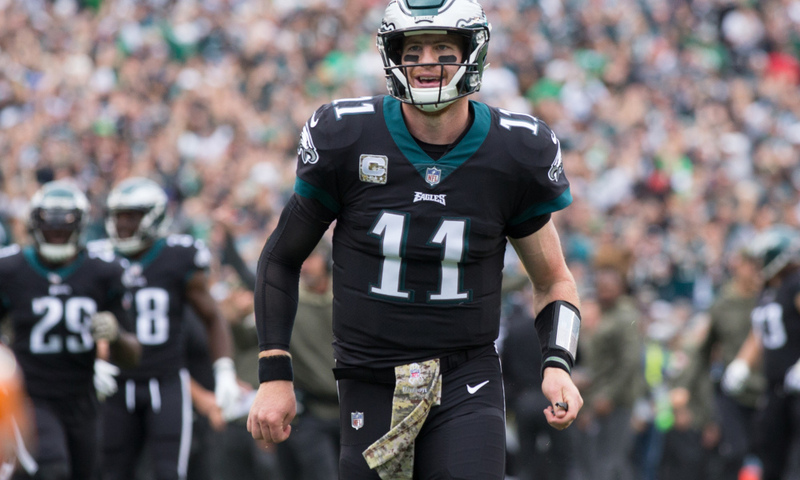 But with the surprising development of being without Carson Wentz’s favorite target, Zach Ertz, a last-minute scratch with a sore hamstring, plus the Broncos being a supposedly elite defense and playing their first game with a new starting QB, there seemed to be some possibility that the game could be closer than expected. This squad doesn’t do let-down games, or toy around with lesser competitors. This 2017 team is a casual destroyer whenever Carson is in the lineup. So perhaps that Broncos pick was a reverse-jinx attempt. Or maybe a way of ensuring one salvageable “win” if they did stumble. For the second week in a row, we were sitting in the proverbial catbird seat, in the Linc on Eagles Sunday, this week in a high perch compliments of Chef Dan Tyrell, of Chef’s Commissary Kitchen in Haddonfield. I made the mistake of at some point pre-game uttering something along the lines of “I’m not scared of Brock Osweiler, but I’m worried about protecting Wentz and moving the ball against this Broncos defense”. Full disclosure, I hadn’t been watching the Broncos on a full-game basis since their early season bludgeoning of the Cowboys on national television. But upon further reflection, Denver is in the midst of a full monthlong freefall. By the time they get done getting drummed by the Patriots this Sunday night, they’ll have lost five straight. They are a bad football team. As the Birds did pretty much whatever they wanted while putting a 50-burger on the Donkeys, John Elway was probably having thoughts like “maybe I shoulda grabbed Kaepernick before the 2016 season”, "I wonder if I can still play", or “well, at least weed is legal in Denver”. The details for this one are fairly irrelevant. It was one of those “everybody eats!” games. You could feel the beatdown coming by mid-first-quarter. No Ertz meant the temporary resurrection of Brent Celek. 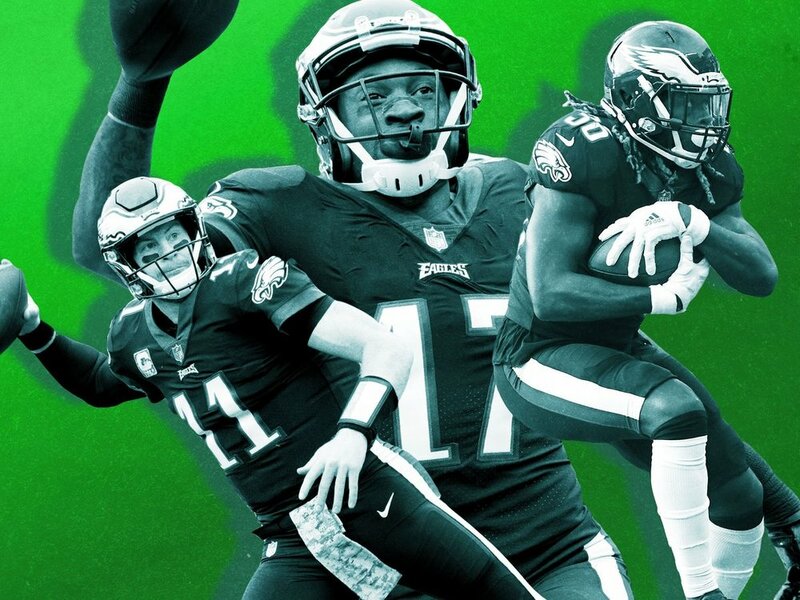 Alshon Jeffrey followed up his best moment as a Bird vs. SF last week, with his best game in green so far against the so-called “No Fly Zone” Denver secondary. #11 Turned This Unit Into the Fly Eagles Fly Zone on Sunday afternoon. The Eagles ran the ball for close to 200 yards on the ground against a defensive line led by one of the league’s biggest freaks, Von Miller. Four different backs got five or more touches, including an 8-carries-for-72-yards (9.6 YPC) debut by Jay Ajayi, who I wasn’t even sure we’d see going into the game, thinking perhaps them having a bye would lead to a slower integration. As the destruction continued and the crowd grew more lubricated and relaxed, the running joke became Chef Tyrell deadpanning “I don’t know how we’re gonna move the ball against this Broncos defense” after every big play. The only thing I enjoy more than being right, is watching the Eagles win. And this team does a lot of that. MVP for Wentz does as well. Even previous whipping-boy Doug Pederson is a legit Coach of the Year candidate. At 8-1 heading into a bye, they have at least three or four more gimme games left: Chicago at home on Thanksgiving week, at the tanking Giants on December 17th and the Raiders at home on Christmas night. I’d probably also say the Rams game at the Coliseum on December 10th, but that one’s slightly debatable. That pretty much leaves the two Dallas games and at Seattle as the three potential trouble spots remaining. The second Dallas game, at home on New Year's Eve, might even end up being a rest starters scenario. Our original 11-5 projection would qualify as a meltdown. Even 12-4 would probably be disappointing. 13-3 is basically par for course by this point. It’s gonna be nice to get a week of rest before heading to Dallas. It’s not out of the realm of possibilities that the Cowboys drop a game at the Georgia Dome next weekend. The Falcons are actually a three-point favorite in ATL. A loss in Atlanta, or especially an Eagle victory 13 days from now in the Jerruh Dome, would all but guarantee the Eagles the division crown before Thanksgiving, for the first time since the year T.O. came to town. And this squad still hasn’t gotten its number-one corner (Ronald Darby) back, have had 2016 Pro Bowler Jay Ajayi in the fold for a grand total of four days, are only just starting to see the kind of numbers from their top wideout Jeffrey they expected, plus get the guy who’s been arguably the best tight end in football back for the Dallas game. With another weirdly tragic week of mass shootings, weaponized truck attacks on pedestrians, federal indictments, plus the strange ongoing re-litigation of the Civil War by public officials, this country may be in one of its darker ages in recent memory. But in the City of Brother Love, the municipality in which our union was founded, Philly sports are in the midst of an athletic renaissance. One that might bless Philadelphia with its first Super Bowl in February. And despite being an Eagles Fan, which by extension requires cautious optimism and healthy skepticism, I ain’t scared to say that out loud. It's a good time to be around this town. DO I HAVE TO SAY HIS NAME?!?! -Is anyone more money on long field goals, or shakier on extra points than Ramblin’ Jake Elliott?!? He missed another last week. -We missed the Nick Foles sighting…but shocker, he fumbled again while getting hit on his front side by a defender he should've seen coming. The only thing we hate more than Nick Foles playing quarterback for the Birds, outside of human-victory-cigar/mop-up duty, is the person that uploaded this video and slandered Carson Wentz's good name in the process. Fix that, dude. If you can't tell the difference between those two, you might wanna find a new hobby. -Why did it feel like there was more people in Bronco gear than fans of division rivals when they come to town? That seemed odd. And what kind of sick maniac wears a Denver Broncos Brian Dawkins jersey to an Eagles game?!? -What a welcome-to-Philly-moment that Ajayi run was. The Malcarney Family (Much Love, RIP Carol), Chef T-Rell, Jerome the Turf Club lot attendant, the old guy in the lot drinking Vodka in his beer…that’s disgusting but the fact that you didn’t vomit was oddly impressive at the same time, the short Carson Wentz doppelganger working the cart, the whole gang at the halftime Head House Row Bud Light Trailer meeting spot, including a fifteen-year-delayed reunion of our old 2737 North Calvert Street Baltimore City house, save the one black sheep Washington fan missing, and finally Carson Wentz just for being Carson Wentz….next home game needs MVP chants like they do in basketball arenas.